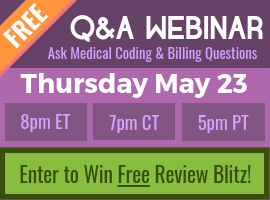 Q: “Is there value to Attending a Coding and Billing Conference?” You bet you, there is. Alicia: There’s beautiful Barb that’s here tonight. Thank you, Barb, for taking those pictures of us together. As we go over to the answer sheet, the one picture is one of our CCO Club members, Barb, who goes to a lot of our live events that we have during the week. The other is the great ribbons that you get at the conferences when you go to a regional or a national. I kind of think those are like gold stars, they’re pretty fun. Physician Queries – This is a big thing with inpatient and now it’s becoming more prominent with outpatient. So, Amber did an excellent job of giving us the rules, the steps that you could use to not lead your provider. I enjoyed that quite a bit. I’ll take away the information that I got from that and share that in some of the things in the future for CCO. An additional one by Michael who is like a mainstay in all of the events, he did Risk Based Compliance Audits vs Forensic (Error) Audits – Understanding the Difference. So, risk audits versus forensic (finding errors). I really honestly didn’t realize that there was much of a difference between the two, but he was able to clarify that. That was a really, really good one. Then, Brenda Edwards who is a fantastic speaker as well, did, Is Your Physician Ready… Coding, Communication, and Documentation. Again, this is really valuable for those coders that are in the trenches. This was just a snidbit; I don’t even know how many lectures were going on at one time. I know that there were probably 10 at a time that you go to choose from and they run you through pretty quickly. So, again, the education is really, really valuable and diverse that you get into both the national conferences and the regional. This was a regional conference for St. Louis. I think they just got done with one in Hawaii prior to that, now they’re getting ready to do one in Utah. Networking has to be number two for me. Really amazing people that I got to meet people that are familiar with CCO, so that’s always fun. They can tell us what CCO does for them that they appreciate and things that we can do to improve and CEUs maybe that they’re looking for, so that was real joy. There were people from all over. I know that when I did my first lecture, I asked where everybody was from and I was going to try to determine while they were working out, getting the slide presentation ready and stuff, where they were from and I thought Alaska was going to be the farthest. There was one lady that I met from New Jersey that had never been to a conference before and just decided that she was going to take a chance and she took a plane to St. Louis and she really enjoyed herself. But the farthest away was Bahamas and I’ll never forget her because she came and gave me a big old hug; that was a lot of fun. The takeaway is from having people from all over that are at these conferences is that everybody’s got a unique coding skill set. A lot of oncologists were there, wound cares, people that specialized in the billing, multipractice providers and specialties. It was really, really diverse. A lot that specializes in risk adjustment, but the thing that we have in common is that we’re coders, so we spoke the same language. It was a lot of fun to get to network. That is pretty amazing every year to get to go to a conference and do that. Last that I would say is the CEUS follow-up the education. This particular conference you could get 14 CEUs. They were, like I said before, juicy and meaty topics that were really relevant to what was happening in the coders’ lives. The events were 1 to 1.25 CEUs. CCO got to do three lectures and you can imagine because you probably heard me do those: Understanding the Disease Process in Coding,that was my biggest one. They gave me a big giant room for that one, so that was a lot of fun. Pharmacology Knowledge and the Coder also was well received, as you know we have a pharmacology course that we’ll be launching soon. And, a friend from St. Louis, Gail Gordon was going to speak on Population Health Management and since we’ve worked together before she had an emergency and had to go to Florida after the hurricane for her mother and wasn’t able to attend, so AAPC asked if I could do her lecture. It was her slides and her presentation and then I was able to give a really great information, too, went over very well. So, what do you get from going to a conference like the young lady that came out of New Jersey that never been to a conference, brand new at coding, it builds your confidence. She was shy, but by the end, coders are real receptive to new people and sharing, so I think that was beneficial to her. The knowledge base, and it’s all relevant and fun, they had a lot of fun at the conference. Networking, I got to meet some people that will benefit CCO for HIPAA education and some other things. Not only is it a chance to get away from your everyday life for just a few days and be treated really special like a queen because you had to eat out and the hotel staff takes very good care of you, making you feel great, and so do the AAPC conference people. So if you think you want to go to conference nationals this year which is really big. That is going to be in Las Vegas. It’s May 7-10 and that is the 2017 HEALTHCON conference and you can register now for it. When you register early, th4re’s a discount. You get to pick your speakers. I went through and looked at all the speakers and there’s a bunch of great speakers and topics that are going to be at nationals, so I hope to see you there. If you see us, Laureen, I or any of the CCO people, then make sure you take time to come up and talk to us. Is there anything, Laureen, real quick from the conferences that you’ve attended, besides those things, that stand out for you? Laureen: Normally, like sometimes you learn a little bit about the area you’re going to. They normally have some sort of outing or something planned, more for the social fun aspect of it, so I like that. But, Vegas seem to be a really good one. I happen to be, my first AAPC conference was their first Vegas one, it was my first time being a speaker, so it was pretty fun. But yeah, I still have relationships from back then, from that first conference that I still have today, and definitely the networking is what helps you. You collect business cards, you write down on the back what they specialize in, so if you get into that. Who said that’s really good at OB-GYN? I need to verify this. That’s really what I think is great about conference, and just the energy and feeling a part of it. I now love modern technology and doing the remote stuff that we do, so my kids need me more. I can’t travel as much so I had to be very selective about the ones that I go to, but yeah, I like national. I like the size of that. Last year we had regional in Atlantic City, so I had to go because that’s 20 minutes from my house, so that was nice because I could actually bring my daughter who totally loved it. She was all into the booth and keeping it decorated with the pins and people would walk by and she’d really get into it. Alicia: Another thing to remember that national is the big conference every year. Regionals are the ones that are a little bit smaller but still a pretty big conference. And then your local chapters a lot of times will have, St. Louis has a conference that’s the St. Louis Chapter Conference every year where you can get maybe 14 CEUs but it’s much smaller and it’s usually one day or two days. It brings in, not everybody does that but some of the bigger chapters like St. Louis join with the surrounding, there’s a couple one in St. Louis, so there are several opportunities. Laureen: There are vendors being able to go around in the auditoriums and get a feel for new stuff that’s going on, job opportunities, different coding books that you might not have known about that you could actually flip through. Boyd: There’s a bunch of questions about our dates here, it says 2017 HEALTHCON. Is that supposed to be 2018 instead? Alicia: You know what, I just grabbed that from the website. You guys probably want to go and verify that. I just grabbed it from the website; I hope that was the right one. Boyd: They actually read out slides, can you imagine that? Alicia: The AAPC conference has gotten so big now that they used to go all over and kind of switched up. Ah! ‘18 is going to be in Orlando, not Vegas. It is in Orland April 8-11. What I was telling you is that they’ve gotten so big, they can’t just travel and do different places across the United States any more like they would do Hawaii, they did Tennessee one year; now they just go between the two venues because quite frankly nobody can hold that many people. Disney and Vegas can. Here’s the updated information 2018 HEALTHCON Registration in Orlando, Florida, which is going to be at Disney. It’s April 8-11. Thank you guys for catching that! Laureen: That was a fun one; I got to bring my kids to the first time going to Hawaii. That was pretty cool. Alright! They’re breaking it up so that you can experience small, medium and large events or what’s convenient to you travel-wise, so it’s pretty cool! I know Alicia’s talked about wanting to do a CCO conference. Alicia: Oh, yeah! That’s going to happen one day, guys.